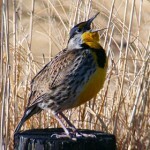 Harsh “shack.” Song is series of rising and falling whistled phrases, similar to W. Meadowlark. 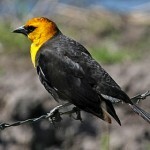 Description: Adult male has black hood, back, throat, tail, and wings. Lemon yellow underparts, rump, and wing patch. Female is yellow-olive and streaked above; dull greenish-yellow below; and throat shows variable amount of black. Juveniles are similar to females but lack black on throat and are duller above. Behavior: Song is often delivered from atop a yucca, juniper, or other tree. Food: Diet consists of insects, fruit, and has been observed taking nectar. Habitat: Usually found in pinyon-juniper woodlands in montane semi-arid areas. Also seen in yucca trees or palms in deserts, and sycamores or cottonwoods in canyons. Where in Nebraska: Accidental. One documented record: a single adult male in Hall County in 1975. 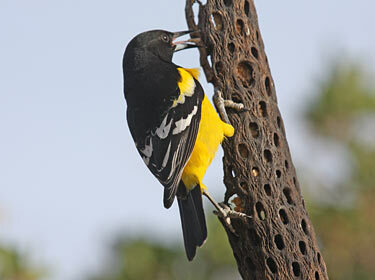 Fun Facts: The Scott’s Oriole is closely associated with yuccas in much of its range. 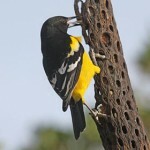 It forages for insects on yucca plants, eats nectar from yucca flowers, and weaves its nest from dead yucca leaves.